Maxwell Maltz was an American cosmetic surgeon and author of Psycho-Cybernetics, which was a system of ideas that he claimed could improve one's self-image. In turn, the person would lead a more successful and fulfilling life. He wrote several books, among which Psycho-Cybernetics was a long-time bestseller - influencing many subsequent self-help teachers. His orientation towards a system of ideas that would provide self-help is considered the forerunner of the now popular self-help books. The word cybernetic comes from the Greek for 'steersman', and in the modern sense usually refers to systems of control and communication in machines and animals: how, for instance, a computer or a mouse organises itself to achieve a task. Maltz applied the science to man to form psycho-cybernetics. However, while inspired by the development of sophisticated machines, his book denounced the idea that man can be reduced to a machine. Psycho-cybernetics bridges the gap between our mechanistic models of the brain's functioning (cliches like 'Your brain is a wonderful computer'), and the knowledge of ourselves as being a lot more than machine. Maltz's genius was in saying that while we were 'machines', and while the dynamics of goal-setting and self-image might best be described in mechanistic terms, the fantastic variety of our desires and our ability to create new worlds were uniquely human. What could never be reduced to machine analogies were the fires of imagination, ambition and will. 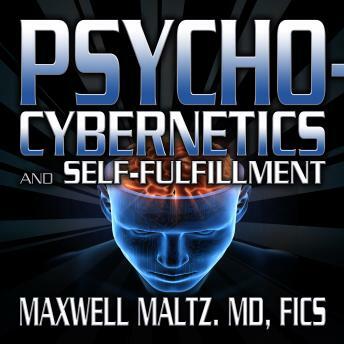 In this audibook "Psycho-Cybernetics and Self-Fulfillment", Dr. Maxwell Maltz teach about: Goals, Self Image, Happiness, and much more. Read by Matt Furey, The President of The Psychocybernetics Foundation.